Alzheimer’s is a neurodegenerative disease affecting mental capacity and behaviour – and eventually leading to death. The exact causes are poorly understood, and there is no cure. Now, on the 100th anniversary of the discovery of Alzheimer’s disease, some of McGill’s leading scientists are helping to unravel one of the most challenging medical mysteries affecting our aging population. On the left, a normal brain; on the right, a brain shrunken and ravaged by Alzheimer’s. It is predicted that the disease will affect almost 600,000 people by 2025, double the current number of victims in Canada. The first signs seemed harmless—forgetting names and misplacing things. Three years ago, however, life began to insidiously change for Ralph Van Deemter. Once a quick-witted Montreal businessman, the 75-year-old now has trouble recalling everyday words and places, leaving him frustrated and depressed. Alzheimer’s disease (AD) is slowly robbing Van Deemter of his mind. For his wife, France, it is stealing the man she once knew. “For me, the worst thing is to see this brilliant man I married fade away,” she says. By taking part in McGill University’s pioneering Alzheimer’s studies, the couple hopes to fight back—if not stopping the disease, then at least helping others who will face this mind thief. 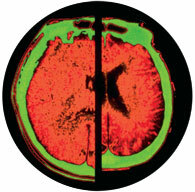 Two research centres, the Bloomfield Centre for Research in Aging at the Jewish General Hospital and the McGill Centre for Studies in Aging based at the Douglas Hospital, are battling the disease on a variety of fronts: developing brain imaging techniques and blood tests as diagnostic and monitoring tools, revealing the underlying physiological mechanisms that cause memory loss and using genetically customized drug treatments and preventions. Dr. Howard Chertkow performs transcranial magnetic stimulation (TMS), a non-invasive procedure that stimulates brain activity. Chertkow's research explores the therapeutic potential of TMS in treating Alzheimer's disease. According to Dr. Howard Chertkow, Director of the Bloomfield Centre and Co-Director of McGill’s Memory Clinic, diagnosis and treatment must be accelerated. An “epidemic of disastrous proportions” looms as baby boomers approach the stage of life—65 and over—with the highest risk for the ailment. The Alzheimer Society of Canada reports the disease is the most common form of dementia, afflicting an estimated 290,000 Canadians. The number is expected to more than double over the next two decades, making it a major threat for the aging population and caregivers. “As it stands now, we have to wait until people are showing symptoms like memory loss and clinical dementia,” explains Chertkow. “This means we are diagnosing Alzheimer’s when it’s been present in the brain for as long as 20 years.” Chertkow says that early detection also allows doctors more time to implement interventions—such as controlling hypertension and lowering homocysteine levels—believed to slow the disease’s progression. The ability to accurately detect AD in its first stages would help patients make more informed decisions about starting preventive treatments, which can carry toxic side effects at the same time that they slow the progression of the disease. Early detection also gives Alzheimer’s victims a valuable head start in organizing their affairs, before their critical faculties falter. Chertkow is casting the net wide in hopes of catching the earliest possible signs of Alzheimer’s. The multidisciplinary team of researchers he leads is using combinations of cognitive testing, brain imaging technology and biomarkers to explore new methods of diagnosis. Using the brain imaging technologies at McGill’s Montreal Neurological Institute, Chertkow has been snapping shots of afflicted brains. Magnetic resonance imaging and positron emission tomography help him analyze brain scans of patients who have been diagnosed with mild memory loss. Results show that physiological changes might already exist, particularly in the hippocampus (the part of the brain located inside the temporal lobe), before any Alzheimer’s symptoms appear. Dr. Hyman Schipper's latest discovery could lead to a quick and definitive test for Alzheimer's. But imaging and cognitive testing, Chertkow has discovered, are only part of the picture. With brain structure varying from person to person, what is considered normal and abnormal overlap considerably—and the availability of sophisticated imaging technologies is limited. The Holy Grail for Alzheimer’s researchers is a simple biological marker that looks at chemical changes in the body’s fluids. Dr. Hyman Schipper, cross-appointed to the departments of medicine and neurology and neurosurgery at McGill, and investigator at the Bloomfield Centre, is hot on that trail. “Our hope is eventually to have something like in pregnancy diagnosis,” he says, “where you apply a simple blood test and you get a clear and immediate answer.” Schipper is excited about his team’s recent discovery of a new protein function in human plasma, referred to as heme oxygenase-1 suppressor (HOS) activity. The results of a groundbreaking clinical study, published in Neurobiology of Disease in 2006, reveal robust plasma HOS activity in a group of patients with very early Alzheimer’s—but not in other test subjects. Schipper has been awarded a patent on his discovery, which has been licensed to a McGill spin-off company, Osta Biotechnologies Inc., for development of a potential Alzheimer’s diagnostic tool. He is optimistic that if the data hold in larger groups of test subjects, a simple blood test might become available for the early diagnosis of Alzheimer’s in patients with memory loss. Professor Andrea LeBlanc hunts an elusive protein produced in aging brains that kills neurons crucial for learning and memory. 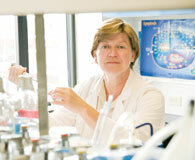 Andrea LeBlanc, professor in the Department of Neurology and Neurosurgery and researcher at the Bloomfield Centre, is trying to unlock the underlying mechanisms that trigger the onset of Alzheimer’s. While most of the worldwide research community has focused on the destructive amyloid proteins in the brain, LeBlanc is following a hunch that alternative suspects might be involved. “We believe that we’ve identified one of the very early markers of Alzheimer’s disease,” she says. The missing piece in the puzzle might be an elusive enzyme produced in aging human brains that, in its active form, systematically kills neurons. Known as Caspase-6, this protein destroys other proteins that are known to be involved in learning and memory. “If those proteins are being chopped up by our enzyme, it may be that this is what leads to the very first signs of cognitive impairment,” LeBlanc says. After a dozen years of studying samples of donated brains and tissue cultures in the lab, LeBlanc hopes next to search for elevated levels of Caspase-6 in the cerebrospinal fluid of Alzheimer’s patients—and then identify specific inhibitors of the enzyme that could stop the disease. Could there be a genetic explanation for the ability of Alzheimer’s to short-circuit and kill otherwise healthy brain cells? The research lab of Judes Poirier at the McGill Centre for Studies in Aging has identified a defective gene that produces Apolipoprotein E type 4 (ApoE4), preventing the transport of cholesterol to the brain and leading to the onset of Alzheimer’s. This abnormal gene can not only trigger the disease but can markedly interfere with drug responsiveness in Alzheimer’s patients being treated with memory-enhancing drugs. The discovery could lead to much earlier diagnosis, along with more effective, customized treatment using the power of pharmacogenomics, the study of how one’s genetic makeup impedes or increases the effectiveness of drug therapy. “We certainly put our finger on the most important genetic risk factor ever identified for the common form of Alzheimer’s,” says Poirier. Poirier is working with McGill spin-off companies to develop drug therapies that will compensate for the reduced levels of ApoE4 in those patients who carry the defective gene. He hopes to delay the onset of the disease by as much as five years. It’s not a cure, but France Van Deemter would happily accept another five years with the man she married. “If we can slow down the sickness, that would be perfect,” she says. “But if that’s not possible now, then maybe it might benefit a patient five to 10 years from now. This research is funded by the Canadian Institutes of Health Research, the Alzheimer Society of Canada, the Alzheimer’s Association U.S., the Fonds de la recherche en santé du Québec, the National Institutes of Health and the Canadian Institute on Aging.